Nolan North is playing yet another treasure seeker in Batman: Arkham City, only with fewer ancient vaults, and more bank vaults. Nolan North has an awful lot of videogame credits to his name, and has lent his voice to roles as diverse as the treasure hunter Nathan Drake in the Uncharted series, to the fourth-wall breaking antihero Deadpool in Marvel vs. Capcom 3. And now he can add another superhero-focused role to his resume: the Penguin in Batman: Arkham City. Rocksteady's Dax Ginn confirmed North's casting as the bird-themed crime boss in a video about the game. The Penguin is often portrayed as the scion of an affluent Gotham family, the Cobblepots. 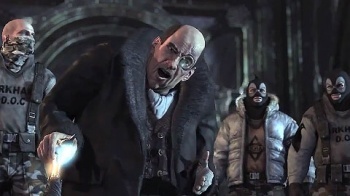 But in Arkham City it seems that not only is the Penguin not from Gotham, he's not even from the US; instead, North gives him Cockney accent, suggesting that he's from - or has at least spent a lot of time in - the rougher parts of London. It sounds like we might be hearing a lot of that voice too, as Penguin is one of a group of villains who will be putting an awful lot of pressure on Batman. Ginn said that Rocksteady wanted to make the player feel the heat pretty much all the time, so that when he or she defeated one of the game's rogues gallery - which includes the Joker, Harley Quinn, the Riddler, and more besides - he or she really felt like the Dark Knight. Batman: Arkham City comes out for PC, PS3 and Xbox 360 on October 18th. Heh, Bruce Wayne and Nathan Drake throwdown against each other. My money is on Drake. I did not know that Nolan North was a big deal or that talented. I didn't know of his existence until Uncharted and his Deadpool voice over is very interesting to learn about. An awesome high five for him. Anyway, I don't HATE Nolan North. His ability to do a wide and varied range of voices is rivaled only by Steve Blum. Not a very good voice though. It's not really news when Nolan North is in a videogame, is it? This is like saying Newsflash! Sun rises in east! Nice to see him using his skills for something other than "smarmy Drake voice" recently, what with Resistance: Retribution's French git, Portal 2 and now Cockney Penguin under his belt. I went in here thinking exactly the same, and then I saw this. Just to add that he DOES sound the same most of the time, but he's also been given a lot of the same Cookie cutter hollywoodesque type quipping protagonists (Desmond Miles, the guy in Dark Void, Nathan Drake...). So while he does sound the same, maybe it's due to him being somewhat typecast and he may do well with a different, fresh protagonist? More hoping than anything else, here, really. Yes, because every game needs to have Nolan North in it somehow. At least we know for sure that the Penguin will be played by someone decent, though I'd have to see how he plays the character to really approve of this choice. And I'm fairly sure that were it not for that announcement, most of the people who play this game wouldn't have noticed. North has a pretty good range and is a very talented voice actor. I'm glad he's on board for this one. Go onto gamesradar.com, they have a video of him. Surprisingly, he sounds nothing like Nolan North. A shame every other game with him in he just plays Nolan North. You think the Space Core , the Fact Core and the Adventure Core from Portal 2, El Jefe from Sly Cooper, Sigmund from Ratchet and Clank Crack In Time, Dr. Tomoki from Ape Escape, the main character from Fable II, Hades from God of War and Jackie Estacado all sound alike? Newsflash people - Nolan North is a voice actor. Prince of Persia, Nathan Drake, Desmond Miles, they are one of his voices, but he has a fucktonne of range for others. Judging by some reactions, it seems people have forgotten that there's already a trailer showing off the Penguin, where no one noticed it was him. People just see "Nolan North playing Penguin" and then suddenly think he'll be making wisecracks and saying "Kitty got wet!" when he kills you. I think the problem here is that the people who claim he has no range are the people who don't bother checking to see his other roles. I am convinced I am the only person on this site who realises Nolan North was the Space core. Didn't he also voice Deadpool,cause Deadpool sounds nothing like Nathan Drake if you ask me. You have to remember that Nolan North practically voices everyone so it may seem like that,but sometimes he just works. I think At this point, we basically just put an award out at the end of year. "Best Nolan North of the Year". And the Nominees - Nolan North in Portal 2. Nolan North in Batman Arkham City. Nolan North in Ultimate Marvel Vs. Capcom 3. Nolan North in Darkness II. Nolan North in Uncharted 3. And the winner is.... Nolan North. Soooo... they hired an American voice actor to play a British character. My question goes thus: Whyyy? I like North, but this is just weird. I said Best. Does there exist a flatter, less interesting character than Desmond? Nolan North made tons of voice work well before this generation of games(for example, he did 3 voices in God of War 1) and I don't really mind. He's terrific at his job, in games and movie voice acting. His usual 'Drake voice' is just one of the many voices he's used. I'll direct your attention the the 1992 movie with Dannie DeVito. But furthermore, where do you get the idea he's british? The Penguin was born in Gotham. To be fair, if people feel that way is because he does sound tremendously alike and generic on pretty much all of his protagonist roles. That overshadows his admittedly good work on other games. He voiced Raphael in the TMNT movie. He voiced 3 characters in God of War 1, including Hades. Chances are you never noticed his voice in many other games and movies, some of them quite old. EDIT: And this is only part 1. So I guess that means the Penguin is going to be eating chimichangas with Deadpool in SPAAAAAAACE~! ... Yeah I couldn't help myself. On a related note, I think Nolan North and Steve Blum made a bet to see which of them could be in the most video games humanly possible. Does that sound like Nathan Drake to you? Only a couple of his characters sound alike. But regardless of what he sounds like, I don't like this incarnation of the Penguin. Something like DeVito's Penguin would've been just perfect. Are you taking the p*ss? He's in bloody everything, the only you won't notice that unless you look it up is because his performances are so varied. Seriously, look at that list. The man's a human soundboard! There's a reason for that if he's to be believed. He says a lot of the time nowadays people just want him to do his normal voice because they want a guy who sounds like an everyman, which to be fair, Drake, the dude from Alpha Protocol and pretty much every dude he's done in the past few years are voiced in that way. But trust me, the range is there. When you hear him do an impression of Christopher Walken talking about manatees, that's how you know. I think that this quote from Sanzaru Games sums up the situation perfectly, "It's not an action game without Nolan North". They said this when talking about Sly 4 and when Sly was fighting a boss character voiced by north.